A friend recently asked me if during my upcoming visit, can I give her a few cooking tips. How flattering! I was trying to think if I actually had any tips. I’ve decided my tip is this: fresh lemon, fresh garlic, fresh herbs. That’s it! That’s really all you need. This recipe is proof as those three ingredients are the stars. 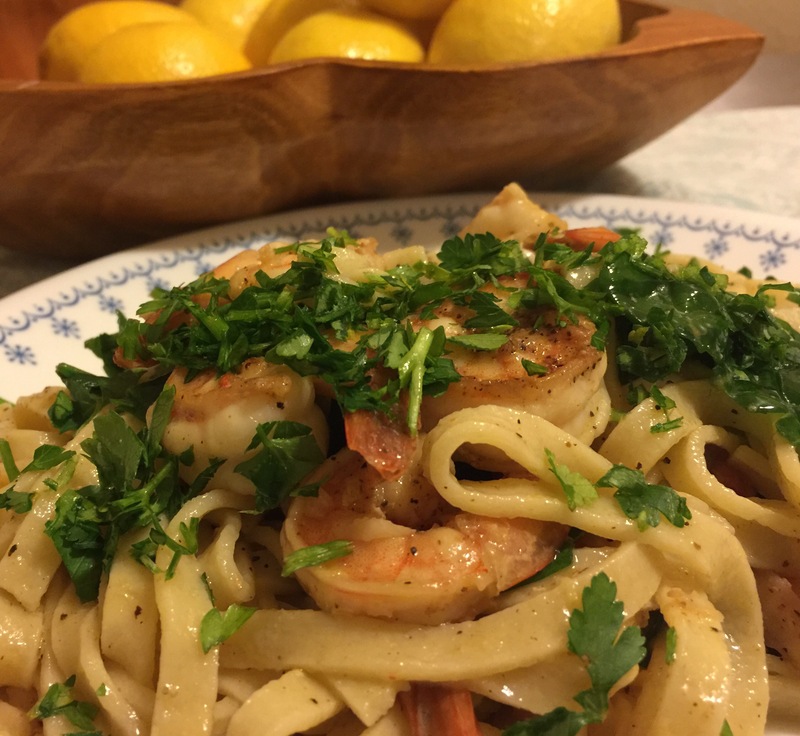 For this easy weeknight pasta (also a good date-night pasta) I buy raw, tail-on, deveined, large shrimp. I actually really love this kind. If you can get fresh, even better. I use my go-to (everyday) seasoning mix: garlic powder, smoked paprika, salt, and pepper to season the shrimp and then I quick sear it. About a minute each side. So fast. If you really concentrate, this can be a 15-minute dinner! I use plenty of butter, lemon juice, and garlic, along with some pasta water to deglaze the pan after the shrimp have been removed. This creates a quick little sauce to toss the pasta with. Top it with shrimp and fresh parsley. I read somewhere to never add cheese to a seafood type pasta. So I don’t. But you definitely can. I mean, lobster mac and cheese is delicious so it can’t totally be true. However, with a light and simple dish like this, I like to let my favorite trio of lemon, garlic, and herbs shine. And plus, you have all that butter. 1 large lemon or 2 small lemons, zested and juiced. Buy this and one of these if you haven’t already. Heat a Large Pot of water to boiling. Meanwhile, zest and juice and lemon, chop the garlic and parsley, set aside. Once the water is boiling, add some salt (this will help flavor the sauce later) and add the pasta, cook according to package directions. Some fresh pastas are done in as little as 2 minutes, so pay attention! Reserve a 1/2 cup of the pasta water before you strain the pasta, set the pasta aside. Heat a little oil in a non-stick pan- or use a little more oil if not a non-stick, heat to medium-high. Once the pan is hot, add the shrimp. Sear each side for about 1 minute each. Remove the shrimp. Add about half the pasta water to the pan, and continue to keep over medium-high heat. Scrape up any cooked shrimp and seasoning bits to de-glaze the pan. Save the rest of the pasta water to add to the sauce later in case more liquid is needed. Reduce heat to medium-low. Add the butter, lemon zest, lemon juice, garlic. Season with salt and pepper. Stir in 1/2 the parsley. Add the pasta to the pan with the sauce. Toss well. 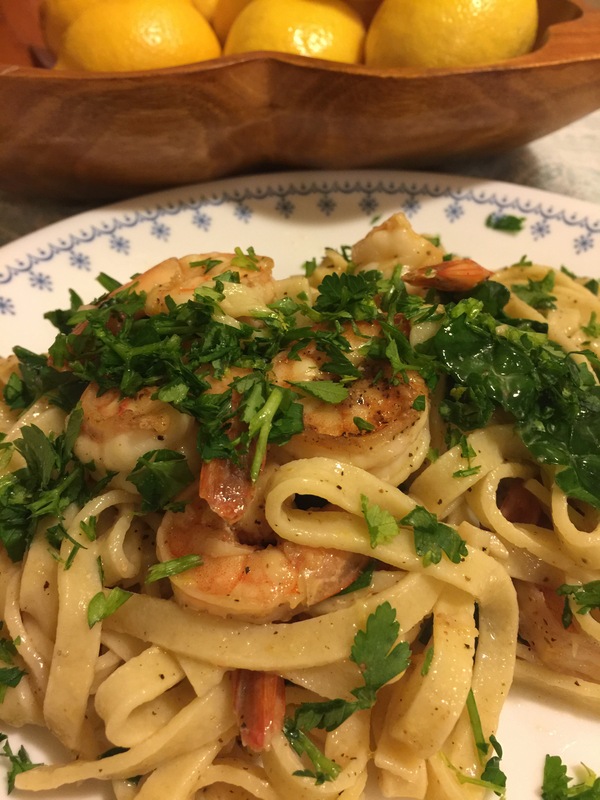 To serve, divide the pasta and top with the seared shrimp and fresh parsley.